"The consequences of behavior determine the probability that the behavior will occur again"
Psychologist B.F Skinner known as one of the leaders of behaviorism furthered the behaviorist perspective. He was very much influenced by Pavlov’s experiments and the ideas of Watson. Skinner believed that the best way to understand behavior is to look at the causes of an action and its consequences. This was his concept of operant conditioning. Operant conditioning demonstrated the effect of positive and negative reinforcement on behavior. For example, children can receive rewards like money for doing chores which leads them want to keep repeating that behavior to receive the rewards, thus strengthening behavior with positive reinforcement. You can also use negative reinforcement to streghthen a behavior by removing or stopping an unpleaseant experience. Not only operant conditioning strengthen ones behavior, but it can also help get rid of undesirable behavior. For example, taking away privileges from a child as punishment for talking back to their parents it will lead the child to want to not be disrespectful next time. As a result, this gets rid of their undesirable behavior. Skinner teaches a pigeon using positive reinforcement. At the start of his experiment the pigeon moved his head in every direction. As soon as the pigeon moved his head to the left Skinner reinforced that movement by giving the pigeon access to a dish of grain. Skinner then waited for the pigeon to turn further to the left. Ultimately, the pigeon began to turn in a completely circle having learned only when he turns he will be rewarded. Skinner was able to teach pigeons to do complicated behaviors people wouldn’t have even thought possible by breaking down behaviors in small steps and using positive reinforcements along the way. 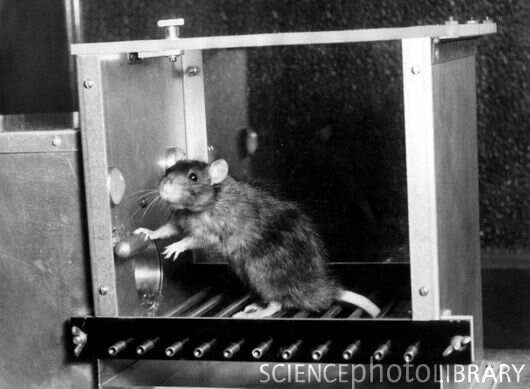 Skinner showed demonstrated how negative reinforcement worked by placing a rat in his Skinner box with unpleasant electric current. Evidently, the electric shock caused them discomfort. As the rat went around the box exploring his surroundings it accidentally knocked the lever. Immediately the electric current would be switched off. The rats soon learned to go straight to the lever after a being put in the box various times. To avoid the consequence of the electric current the rats repeated the action again and again.